This morning I have two things to show. First up is Ladder to the Stars 2 – aka Deadline II. This is the quilt I made back in October to test my pattern which was published yesterday in The Quilt Pattern Magazine. Not only was I testing the pattern, I was also testing my quilting design. It was an epic fail, so I backed up and punted to get the original Ladder to the Stars quilted. A very good friend ripped out all of the quilting for me and then I spent the last part of the week quilting this on my sewing machine. Curves in the sashing and straight lines in the blocks and setting triangles. The border has a diamond cable. I used bleached Warm and Natural batting and the thread – top & bottom – is — well shoot. I’ve lost the label — I’ve used it before so I’ll dig through the blog and find the information and add it to this post later. 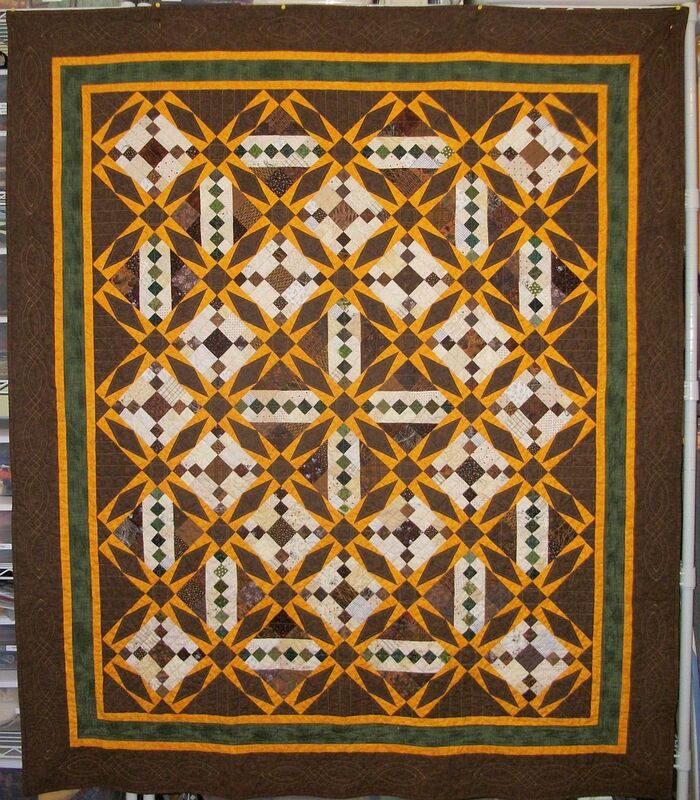 cairo-quilt 100% cotton in Honey Gold. After washing the quilt finished at 57″ x 68″. In addition to finishing the quilt, I worked on my Jared Takes a Wife blocks. 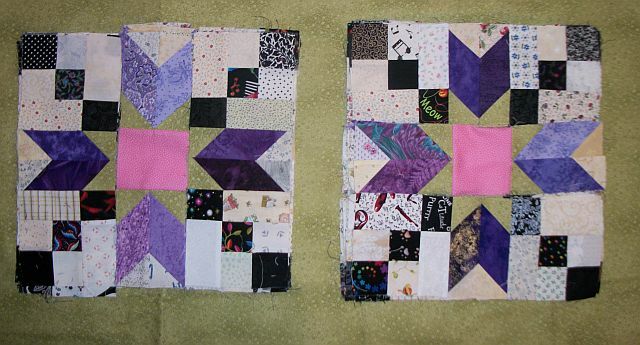 Two more seams on each block to go. The brown quilt looks really good. I am currently quilting on a project where the fabrics looked great close up, but when I took a picture of it, two of them were so close together in value that they blend together. Your Jared Takes a Wife blocks are lovely. The pink centers really pop. Love your design in your finished quilt. The yellow just jumps out and is wonderful. Your ladder quilt is stunning. I can’t imagine taking out the quilting. So glad you were able to finish it.